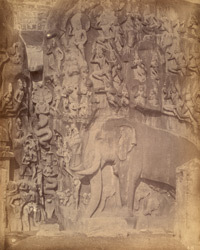 Photograph of a detail of the rock sculpture known as Arjuna's Penance at Mamallapuram in Tamil Nadu, from the Archaeological Survey of India Collections taken by Alexander Rea in the 1880s. Mamallapuram derives its name from the title 'Mahamalla' or Great Wrestler of the Pallava king Narasimhavarman I (r.c.630-668). Covering two huge boulders 27 m long and 9 m high, this remarkable carving in low relief is alternatively called the Descent of the Ganga. Scholarly analysis allows for both interpretations of the subject-matter of the sculpture which is considered above all to be an eulogy through mythology of Narasimhavarman I, its probable patron. One theory views this as Arjuna, one of the Pandava brothers in the Hindu epic Mahabharata who underwent penances while praying to receive a magic weapon from the god Shiva. Another theory views this as the sage Bhagiratha who underwent penances while praying to Shiva to catch the river Ganga in his matted locks as she descended to earth, all the animals and myriad beings watching the miracle. Originally water flowed along a central cleft with naga figures.